Video footage has been released of a robot that can leap over obstacles more than 7.5m (25ft) high. But the Precision Urban Hopper can use a piston-actuated "leg" to launch it over obstacles such as walls or fences. The robot could boost the capabilities of troops and special forces engaged in urban warfare, say researchers. The programme is being funded by Darpa, the US military's research arm. Earlier this year, Sandia National Laboratories awarded the contract to build the next generation of the hopper to Massachusetts-based robotics firm Boston Dynamics. 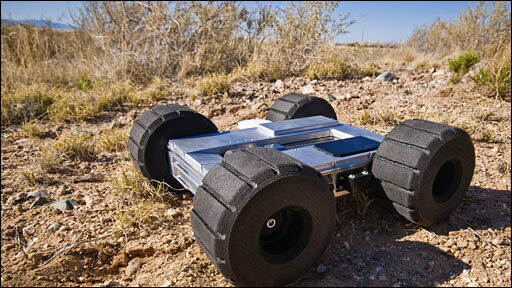 Researchers at Sandia have tried out the robot on a variety of different surfaces. The semi-autonomous, GPS-guided gadget could be used for surveillance in urban environments. Its developers say this could potentially reduce troop casualties. Testing and delivery of the Precision Urban Hopper is planned for late 2010.